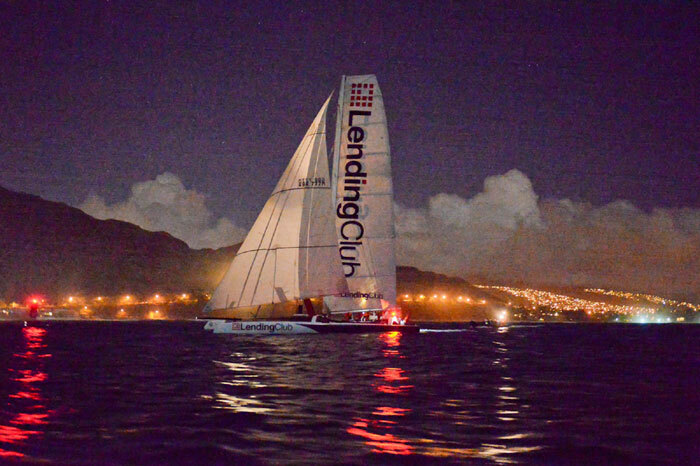 Tritium Racing/Lending Club was first to finish the 2013 Transpacific Yacht Race — better known as Transpac — from Los Angeles to Honolulu, at 9:52 p.m. (Hawaii time) July 18. The crew covered more than 2,225 nautical miles in five days, 11 hours, 52 minutes and 33 seconds. The Tritium Racing/Lending Club crew faced several unexpected challenges along the course, including large amounts of debris left over from the tsunami in Japan in March 2011. According to a statement from Tritium Racing, the delays and concern for safety prevented the crew from breaking the race record set by Bruno Peyron in 1997 aboard Commodore Explorer, an 86-foot catamaran, in five days, nine hours, 18 minutes, and 26 seconds. Transpac’s first race was in 1906 and took 12 days to complete — and the biennial event has since become one of the premier international sailing races. The Tritium Racing/Lending Club 73-foot offshore trimaran started the race July 13, in the third of three staggered starts for 58 competing boats. The other starts were on July 8 and July 11. “This was an extraordinary journey, and I couldn’t be prouder of the amazing crew of world-class sailors, our terrific partner Lending Club and this truly remarkable yacht that we were fortunate to race,” said John Sangmeister, yacht owner and skipper, and president and CEO of Gladstone’s Long Beach.